Pancakes are a weekend breakfast staple for many, but the traditional version made with white flour and butter leave a lot to be desired nutritionally, especially when drowned in sugary pancake syrup. Pancakes usually have very little protein or fiber, leaving you in a carb-coma and then hungry shortly thereafter. They are also usually loaded with sodium thanks to baking soda and baking powder, with boxed mixes clocking in even higher. If you’re trying to eat a little healthier, you can still enjoy a weekend pancake breakfast with this recipe for greek yogurt blender pancakes. They are made with oats, whole wheat flour, and Greek yogurt for a filling combination of protein and fiber. They also use only a small amount of baking powder and no baking soda to cut down on the sodium. The best part is that they are super easy to make. Simply combine all of the ingredients in a blender and you’re halfway to pancakes! It’s almost as easy as a boxed mix, but way more nutritious. Preheat a pancake griddle or nonstick skillet to 350F. Pour 1/4 cup batter onto hot surface for each pancake. Let cook until bubbles start to appear on the surface, about 1 to 2 minutes, then flip and continue cooking until done, another minute. Repeat with remaining batter. Serve with fresh berries and a drizzle of honey or real maple syrup. If you can find it, use reduced-sodium baking powder. It can be found in the baking aisle of most grocery stores. To make blueberry pancakes for additional antioxidants, drop fresh blueberries directly onto the batter after you pour it onto the griddle. Or, use any other fruit or nuts for fun variations. Round out the meal with fresh fruit and a scrambled egg for even more protein and a balanced breakfast. Extra pancakes can be frozen in a freezer-safe zip top bag and reheated later for easy weekday breakfasts. 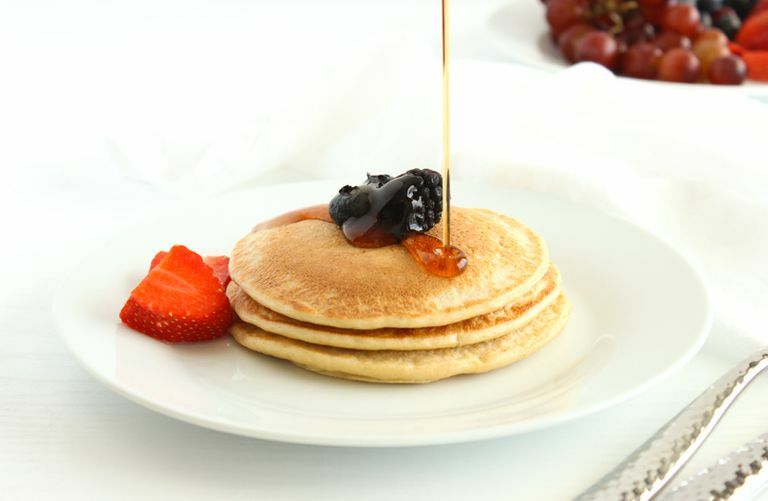 To keep the sugar in check, serve these pancakes with fresh fruit and watch the amount of maple syrup or honey you use. Try to stick with 1 tablespoon.